These internet pages are intended to provide general information about RMG Messtechnik GmbH, its products and services. They are not meant to provide specialist advice or instructions concerning the products and services sold by RMG Messtechnik GmbH. 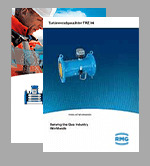 For special enquiries concerning our products and services, please contact the RMG Messtechnik GmbH directly. We will do our best to provide you with accurate and up-to-date information. However, RMG Messtechnik GmbH cannot be held liable for damage occurring in relation to this information. Therefore, we do not accept any warranty or guarantee either explicitly or by conduct and do not make any assurances with regard to the accuracy and completeness of the supplied or referred information. The use of our internet pages and all other (link) pages with which they are connected and their contents is at the user’s own risk. Neither RMG Messtechnik GmbH, nor any other party involved in the production, provision, design or maintenance of the entire internet presentation or individual parts thereof or of the pages or presentations linked to ours is liable in any form for any direct or indirect damage, or damage with or without fault which may occur as a result of access to, the use of, or inability to use the internet presentation of RMG Messtechnik GmbH or the information presentations to which it is linked. These internet pages also contain information from third parties and suggest links to other internet pages. Wherever possible, these are marked accordingly. We cannot accept any liability for information provided by third parties. All pictures and information contained in these internet pages, insofar as they are reproducible, are protected by copyright or by other industrial property rights. All product names are trademarks of RMG Messtechnik GmbH concern. The use and reproduction of this information is not permitted without the prior written consent of RMG Messtechnik GmbH. We reserve the right to change the contents of these internet pages without previous warning, whenever we consider this appropriate. No liability ensues from this.